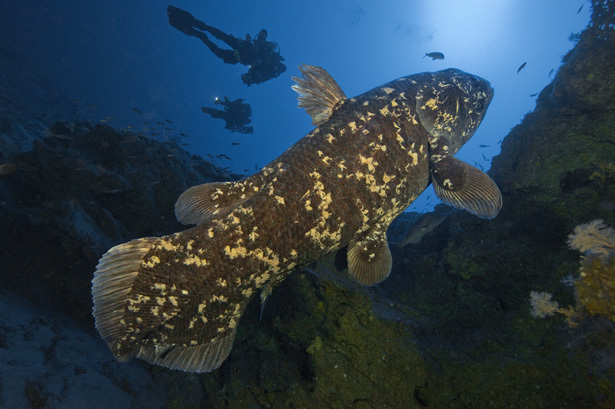 Ever since the significant discovery of a living coelacanth specimen in 1938 off the east coast of South Africa, all aspects of the species’ evolutionary history, current distribution, morphology and ecology have been under intense scrutiny (Nikaido et al. 2011). This search for a more in-depth understanding of the Latimeria genus to which the two extant species belong is an attempt to explain the evolutionary pressures influencing this fish over time, resulting in the relatively unchanged form of today. 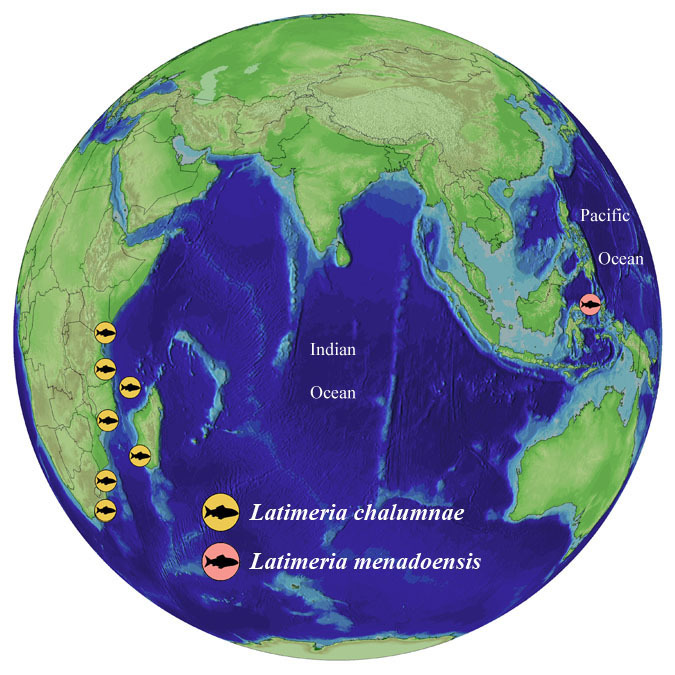 Latimeria chalumnae (inhabiting the West Indian Ocean) and Latimeria menadoensis (an Indonesian species) are currently the only two extant species constituting the Latimeria genus (Holder et al. 1999). Evidence from the fossil record indicates that coelacanths evolved into a form closely resembling that of the present approximately 400 million years ago and until relatively recently were thought to have gone extinct between 70 and 80 million years ago (Johanson et al. 2006). This is suitably one of the most famous forms of a Lazarus Taxon, one that has disappeared from the fossil record for one or more geological time periods only to resurface again in either excavations of younger strata or in the present day as a living organism (Twitchett et al. 1999). This is not to be confused with the term “Living Fossil” so often used to describe the coelacanth species. A “Living Fossil” is defined as a species that has changed little in form when compared to fossilised remains and is not closely related to any other extant relatives (Friedman et al. 2007). Through the comparison of a living coelacanth specimen with its closest relative (Fig 2), extinct Macropoma lewesiensis, the extant species shows morphological differences distinct enough for it to be classed as a different genus (Casane & Laurenti 2013). This indicates that even though extant species are significantly similar to their extinct relatives, evolutionary pressures have in fact influenced the changes seen in the present form, however slight they may be. Further analysis on this aspect of coelacanth evolution will be explored within a later section. This literary review serves to evaluate the various theories regarding the evolutionary history of the Latimeria genus as well as to highlight the reasons as to why these coelacanth species have retained their prehistoric form. The principle drivers behind the evolutionary process include; but are not restricted to, natural selection and mutation, which can be simply defined as changes in the inheritable traits within a species over successive generations (Hall & Hallgrímsson 1998, Kimura 1991). Through natural selection these traits are deemed favourable and selected for thereby increasing in frequency and eventual fixation within the population (Kimura 1991). This adaptive response is due to various environmental pressures experienced by the organism over time leading to a possibility of divergence between two forms and subsequent speciation (Cook 1906). The evolutionary history evident in fish species is vast with the group being split into three extant classes including Agnatha (jawless fish), Chondrichthyes (cartilaginous fish) and Osteichthyes (bony fish) (Romer & Parsons 1985). This last taxon of bony fish is further subdivided into two subclasses constituting Actinopterygii (ray-finned fish) and Sarcopterygii (lobe-finned fish) into which the coelacanth falls (Casane & Laurenti 2013). Figure 2: Actinistia Phylogeny indicating the diversity in body shape and length of the species within this largely extinct taxon – Forey 1998. The evolutionary history of the coelacanth can be gleaned, to a certain extent, from the fossil record. This form of analysis, while accurate to a certain degree, remains unfinished and is therefore notoriously imperfect. 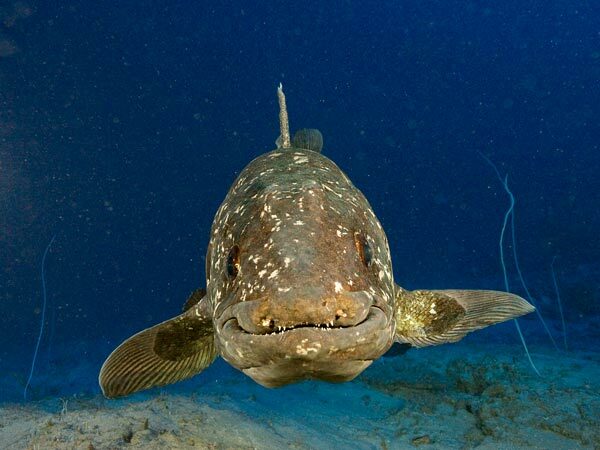 This aspect is important with regard to the gaps contained within the record of the coelacanth as, given current knowledge, they can now be attributed to either low population numbers or the environment inhabited being particularly inaccessible, as opposed to outright extinction (Twitchett et al. 1999). As previously mentioned the coelacanth, in a form resembling its current shape, first appeared in the fossil record approximately 400 million years ago and has managed to survive relatively unchanged over the subsequent millennia. Below outlines a collection of some of the current theories explaining the factors involved in making this possible. The environment in which a species lives plays a significant role in shaping an organism’s form and behaviour. The coelacanth inhabits an extreme but relatively unchanged environment along the coasts of Indonesia and East Africa; more specifically Mozambique, Kenya, Madagascar and the Comoros Archipelagos where a viable population has been discovered (Fricke et al. 1990). The fish has also been observed off the coast of South Africa but because of the minimal number of sightings, both here and along the rest of the African coastline, it is thought that these individuals were merely drifters from the main colony in the Comoros (Nikaido et al. 2011). This is until a relatively substantial number of the species being observed off the coast of Tanzania led to an investigation as to whether or not a genetically distinct population resides there (Fricke et al. 1990). A group was also discovered in Jesser Canyon, Sodwana Bay off the shores of Kwa-Zulu Natal on the east coast of South Africa by divers in 2000 suggesting that pockets of these fishes occur within suitable habitats across the Indian Ocean (Nikaido et al. 2011). Whether in the Indian or Pacific Ocean, the natural habitat favoured by the species within the Latimeria genus is that of sheltered caves situated at depths of around 250m (Bruton et al. 1992) although recent observations indicate migration to greater depths of up to 700m at night in order to hunt (Hissmann et al. 2000). The coelacanth is the epitome of a specialist species as can be seen by its limited habitat range. Though it is found in various isolated pockets scattered across the Indian and Pacific Oceans its habitat requirements remain highly specific. Using the Grand Comoro study carried out in the late 1980s as an example, the coelacanth was found to inhabit only the west coast of the island at depths from approximately 200m where, with the steep slopes dropping off at angles of roughly 45° and where the substrate consists of recently formed submarine lava flows scattered with deep caves, despite the topography being only marginally different from the island’s east coast (Fricke et al. 1990). Vertical distribution limits are determined by a combination of a strong intolerance to temperatures above 22°C, light and oxygen restrictions and the requirement of minimal water movement, it is assumed that these fish are weak swimmers, making the deep water caves and canyons in which they aggregate ideal (Ribbink & Roberts 2006). Even when taking these highly specific habitat requirements into account, the depths at which these species are found may significantly influence the way in which these organisms have been able to survive over the millennia while still retaining their relative prehistoric form. The presence of caves within home ranges is also thought to play a role in their persistence. The caves and overhangs of the lava flows in Grand Comoro, the canyons of Sodwana Bay and the carbonate caves in Indonesia provide refuge from deep sea predators as well as allowing the coelacanths to retreat into their calmer waters and save energy during periods of inactivity (Fricke et al. 1990). The depths at which these caves occur are situated within the “Twilight Zone”, a region of the water column that has remained relatively stable over extensive periods with a water residency time of approximately a hundred years, minimal oxygen availability and no seasonal temperature variation (Childress & Seibel 1998). Figure 3: Global Distribution – Smithsonian. In contrast to the comparatively unchanging environment of the mesopelagic zone, one that does not appear to promote variation and speciation, one of the most fundamental evolutionary processes, is that of Lake Tanganyika and its two hundred and fifty species of cichlid fish (Takahashi & Koblmüller 2011). This extensive water body situated in the African Rift Valley is home to a genus of fish that underwent rapid speciation and adaptive radiation from a single common ancestor to the numerous forms found today resulting in these East African Great Lakes containing the highest diversity of cichlids (Turner et al. 2001). The reasons behind this type of explosive speciation are either the sudden availability of new niches, habitat heterogeneity or extreme environmental conditions where selection strongly favours adaptation (Hendry et al. 2007). Habitat heterogeneity being the significant difference occurring between the environment inhabited by the coelacanth and that occupied by a rich diversity of cichlid fish. It has been indicated that the water level fluctuations experienced in the lake over time has resulted in habitat fragmentation and isolation acting as promoter events for speciation (Rossiter 1995). While both groups are specifically adapted to their respective environments, the species in the lakes are exposed to a highly dynamic ecosystem with a complex and turbulent history resulting in the need for rapid forms of adaptation in order to survive whereas the coelacanth’s environment appears to accomplish the exact opposite. A static environment over the evolutionary timescales with which we are dealing would act to minimise the need for coelacanth adaptation but does not fully explain the limited variation thought to occur within populations and throughout the 80 million years the current form is thought to have existed. An analysis of evolutionary rates on both a phenotypic and genotypic level is therefore required to further understand the low levels of diversification observed in the lineage. On a genetic level, it has been suggested that a reduced evolutionary rate is the principle cause behind the persistence of this seemingly archaic species in modern times. On the whole, genomes undergo continual changes as a result of numerous processes including the initial mutation and the subsequent selection that acts to either eliminate the unfavourable or fix the favourable traits within the population (Kimura 1991). It therefore stands to reason that the only way for a genome to remain unchanged over time is because no mutations arise, that is no new variants were being produced in the population, or alternatively through the persistent elimination of variants by natural selection (Casane & Laurenti 2013). This argument of no genetic change appears radical in its reasoning especially when taking into account both the time scale of 80 million years, in which little to no variation would have occurred and the fact that fossil evidence has already proven significant phenotypic changes (Fig 2). Taking the morphological changes that have occurred every million years, from the beginning of the Devonian period to present, an accelerated level of change was experienced during the early stages of the Devonian only to decline towards the end of the period to a level that remained relatively stable until the present (Schaeffer 1952). The initial trend could be attributed to the adaptive radiation and successful habitation of newly available ecological niches corresponding with the move from a freshwater to a marine environment between the Devonian and Permian periods (Forey 1998). The decline and subsequent stability could be in response to the fixation of the adaptions most suited to the specific habitat which itself remained relatively stable during the successive periods (Schaeffer 1952). This continues to point to the fact that while the phenotypic appearance remains remarkably similar to previous forms, changes are taking place at what appears to be a far slower rate. Figure 4: Preserved Specimen – Suizokuen. This slow molecular evolution rate has provided a fundamental link to morphological stability based on studies stating low molecular diversity occurring in L. chalumnae populations (Lampert et al. 2012) and low substitution rates within the phylogenetic branch preceding the extant genus (Casane & Laurenti 2013). Because of a restricted source of mutations, the low level of genetic diversity is closely linked to population size with smaller populations showing a decrease in diversity (Nikaido et al. 2011). This limited diversity is further compounded by minimal variation being found between the two extant species and being attributed to the lack of geographic barriers (Lampert et al. 2012). Without a more in depth understanding of the population dynamics, full distribution patterns or the individual ecology and behaviour of the species, this view is largely untestable with the distance between the two known populations likely acting as a barrier in itself. Current knowledge on behaviour highlights a sedentary, non-migratory lifestyle which, coupled with the fact that these fish are thought to be weak swimmers (Hissmann et al. 2000), further supports the possibility that the distance between the Indonesian and Grand Comoro populations would limit gene flow. The early specimens found off Tanzania were even thought to be drifters from the Grand Comoro population (Nikaido et al. 2011). Alternatively, when taking currents into account, it could be possible for specimens to be caught up in the flow of the South Equatorial Current and be deposited off the East African coast. The intricacies involved in the aforementioned processes make it difficult to pinpoint an exact singular cause as to why the coelacanth appears to have remained relatively unchanged over such a vast time period. The studies concerning proposed low levels of molecular evolution as being the root cause for relative morphological conservatism are contradictory to say the least. With a complex link between low substitution rates and the rate of morphological evolution being definitively supported, the conclusions drawn vary and do not always include all the evidence, such as that gleaned from the fossil record. While a decreased substitution rate is evident in gene sequencing studies, it is ultimately affirmed that a stable morphological state does not necessarily suggest an unchanged genomic state and that the reason behind this low substitution rate remains unknown (Amemiya et al. 2013). When taking the fossil record into account, it is clearly evident that variation between the extinct and extant forms has occurred and that these differences have been deemed significant enough to separate generic groupings (Casane & Laurenti 2013). When examining the fossil evidence collected for the extant coelacanth species, two aspects become blatantly apparent. Firstly there is a clear indication of morphological change (Fig 2) between the Miguashaia genus of the Devonian period to that of the current Latimeria genus. Secondly no fossil has been discovered of this current form leaving an 80 million year gap between its closest relative, Macropoma lewesiensis, in which any number of variations could have occurred. As it is, the general morphology between the extinct genera as well as between them as a whole and the extant genus show several differences varying from size to possible locomotion modes (Forey 1998). Size variation ranges from less than 0.1m for the Holopterygius to over 2m for the Mawsonia, the current form approximately 1.5m in length (Wendruff & Wilson 2012). The number and spacing of the haemal and neural arches throughout the ancestry vary suggesting a possible difference in the propulsion methods (Forey 1998). When restricting the comparisons to between M. lewesiensis and Latimeria, the former is roughly three times smaller than its successor. Other anatomical differences include the structure of the swim bladder, solidified in Macropoma and oil-filled in Latimeria suggesting different habitats (Friedman et al. 2007). In addition both the skull and fin anatomy are markedly different between Latimeria and its closest relative, not forgetting that soft tissue cannot be fossilised and thus internal anatomy, a possible determinant for external appearance, could also be distinctly different (Casane & Laurenti 2013). Current species are restricted to the mesopelagic zone of the oceanic water column yet this is not true for the entire clade, the different states of the swim bladder providing supportive evidence of this. A reduction in ossification indicates a move from previous fresh water habitats to the present marine environment, this change becoming evident in the Coelacanthus, of the Permian period, thought to inhabit the open waters of this environment (Forey 1998). Evidence has also been presented with regards to the occurrence of a freshwater distribution during the Mesozoic era indicating an overlap of the freshwater and marine environments (represented by Mawsonia and Latimeria respectively) with the marine habitat dominating from the Late-Cretaceous period (Wenz 1981). The coelacanth is not alone in this form of apparent evolutionary stasis; the horseshoe crab, a marine arthropod from the Limulidae family, being another organism left relatively unchanged over time (Obsta et al. 2012). The origin of this sea creature has been dated back to the Ordovician period of approximately 450 million years ago with the extant species, of which there are four, showing significant similarities to forms present in the mid-Mesozoic, 150 million years ago (Størmer 1952). These animals have closely mirrored the trend experienced in the coelacanth lineage of radiation in the early to mid-Paleozoic era and attainment of apparent morphological stasis occurring from the mid-Mesozoic era, to the point at which they have also been dubbed “Phylogenetic Relics” (Selander et al. 1970). Two schools of thought regarding the determining factors driving slow morphological change over extensive periods have been expressed when debating both coelacanth and horseshoe crab evolution. The first being abnormally low mutation rates equated to genotypic stability (Mayr 1963) and the second including the more popular theory of evolution rates being controlled by the ecological relationships of the species with environmental pressures being the key determinants (Simpson 1944). These species have been deemed to be so well adapted to the particular niche, which itself appears to have remained stable over time and inhabited since the origin of the modern form, that no real need for change has been required (Selander et al. 1970). The adaptations produced early on in the evolutionary history of the extant coelacanth species, in response to a range of environmental influences and pressures, are thought to play a principle role in its persistent survival (Fricke et al. 1990). The habitats where these two species are currently found have remained relatively stable throughout the geological periods in which they have evolved (Childress & Seibel 1998) and yet are considered to be harsh environments, regarding relative physical conditions, to inhabit. With little light penetration, no seasonal variation in temperature and increased pressure, organisms living within this zone require sufficient adaptations in order to survive. 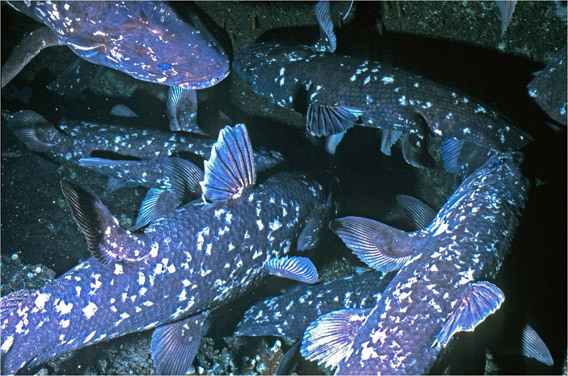 The coelacanth exhibits various physiological adaptations to this environment which include the ability of controlling the metabolic rate, the lowest within the vertebrate group, which would be beneficial in the conservation of energy when inhabiting a low prey environment (Hissmann et al. 2000). A slower lifestyle is also required in response to the relatively small gill area possessed by these fish (Hughes 1976). The ability to initiate a form of hibernation to minimise nutritional requirements, coupled with a sedentary lifestyle is further evidence of adaptations to a low oxygen environment with minimal prey species and is thought to be one of the reasons Latimeria has been so successful as a genus (Forey 1998). Individuals of the Grand Comoro population have been observed carrying out the daily routine of executing a vertical migration to approximately 500m at sunset in order to hunt, returning before sunrise to shelter in small aggregations within caves situated in or near their night time feeding grounds (Nikaido et al. 2011). This daily migration to deeper depths is attributed to a combination of searching for food and predator avoidance as the sand tiger shark, Carcharias taurus, was often encountered by researchers at around the 200m mark (Fricke et al. 1991). The same conclusion of predator avoidance can be drawn for the daytime activity of sheltering in caves (Hissmann et al. 2000). In addition, juveniles are thought to occur at a depth of below 500m in an attempt to avoid both predation and possible cannibalism (Fricke & Frahm 1992). These traits could be a contributing factor as to why these fish have been able to survive in a relatively extreme environment with low prey densities (Frick et al. 1990). Figure 6: Cave Aggregation – Fricke 2011. Along with minimal predation there is no evidence of intra-specific competition with all witnessed aggregations being non-aggressive (Fricke et al. 1990). With prey species being scarce, low population density in this case would be beneficial. While the mesopelagic environment inhabited by these two species is evidently challenging, the fact that they have survived thus far is a clear indication that the coelacanth has carved out an ideal niche in these surroundings and because these surroundings have remained constant, albeit harsh, it appears that the Latimeria species has required no need to alter its being. When reviewing the aspects covered under physiology and behaviour, it becomes apparent that these creatures have in some respects survived against all odds. While being well adapted to a stable yet harsh environment, various conditions posing a possible risk of extinction are met. Although their lifespan is extensive, up to 50 years, they possess a very low reproductive output with a gestation period of approximately three years, the longest in the vertebrate group (Froese & Palomares 2000). This, in combination with a small number of populations, minimal individuals within them and a restricted geographic range, poses the question as to how an organism with such a high risk of potential extinction has been able to persist for 80 million years and in a relatively unchanged form. A number of aspects are thought to contribute to this survival phenomenon but without a full understanding of current coelacanth population ecology, physiology and behaviour, tentative conclusions can only be inferred based on the available data. Factors thought to promote survival in this challenging environment include minimal predation risks being presented by other deep sea predators, such as C. Taurus, the presence of caves within home ranges being highly advantageous in this respect (Fricke et al. 1991). The fact that there have been no recorded signs of intra-specific competition suggests that the population numbers are low enough for the environment to successfully sustain them (Fricke et al. 1990). This delicate equilibrium of small population sizes allowing for environmental sustainability trading off against large enough numbers to ensure population viability and the survival of the species may seem incredibly risky at first glance however the species has had 80 million years in which to perfect it. The future of this species could be a different story all together as the accelerated rate at which global environments are being affected and altered by climate change may in fact be at a pace too rapid to ensure successful adaptations (Sinervo et al. 2010). Taking into account the previously discussed aspect of apparent slow molecular evolution present in Latimeria could point towards these species not having the ability to survive the magnitude of habitat variation and destruction in response to climate change. It could be however that either, because of the relative stability and limited influence of surface conditions on the mesopelagic zone (Childress & Siebel 1998), the coelacanth would continue to exist in a form requiring minimal change or, when confronted with a newly shifting habitat, could simply adapt accordingly. Taking the Sodwana Bay environment as an example, an increase in sea surface temperature would act to increase the depth to which the water column is warmed resulting in an overall downward habitat shift (Hayes et al. 2005). The water temperature of the current coelacanth habitation zone in this region is approximately 22°C, the upper tolerance limit for these fish (Ribbink & Roberts 2006). This shift of preferable temperature conditions could result in this species being forced into deeper water where the presence of caves is severely limited and as this has been recorded as a requirement around which their niche is formed, the occurrence of coelacanths in these waters could be under pressure (Ribbink & Roberts 2006). As mentioned, without an in-depth understanding of how the coelacanth survives in and interacts with its current environment it is close to impossible to predict how these two species will respond to climate change. As known current populations are small, it is important to put procedures in place in order to prevent the possible extinction of these creatures. They have both been listed as critically endangered on the IUCN Red List and various conservation efforts have been initiated in an attempt to avoid this outcome. Since the 1938 discovery of this thought-to-be-extinct fish, significant advances have been made in the understanding of the habitat and biology of these species and yet so many questions remain unanswered. Long term in situ studies, such as those conducted by Fricke et al. (2000) over the past twenty-four years, are required in order to attempt to unravel the mystery surrounding this supposed relic. As these fish are listed as critically endangered, gaining knowledge on simply the distribution patterns of the coelacanth would assist in the formation of marine protected areas in the most effective locations. After reviewing extensive information on the topic of the driving forces influencing the somewhat unusual evolutionary history of the two extant species of coelacanth it can be concluded that amidst the theories and speculation, no definitive answers have yet been reached. While it is clear when comparing the forms of extinct specimens from the fossil record to that of the extant species, these fish have evidently undergone the same fundamental processes associated with evolution; it seems to have occurred at a more gradual rate. The retention of the seemingly prehistoric form has therefore been attributed to both the environmental pressures of their habitat and a lower rate of molecular evolution; bearing in mind a morphological continuity does not necessarily imply genotypic stability. AMEMIYA, C.T. ALFÖLDI, J. LEE, A.P. FAN, S. PHILIPPE, H. MACCALLUM, I. BRAASCH, I. & MANOUSAKI, T. et al. 2013. The African Coelacanth Genome Provides Insights into Tetrapod Evolution. Nature 496: 311-316. BRUTON, M.N. CABRAL, A.J.P. & FRICKE, D.H. 1992. First Capture of a Coelacanth, Latimeria chalumnae (Pisces: Latimeriidae), off Mozambique. S. Afr. J. Sci. 88:225-227. CASANE, D. & LAURENTI, P. 2013. 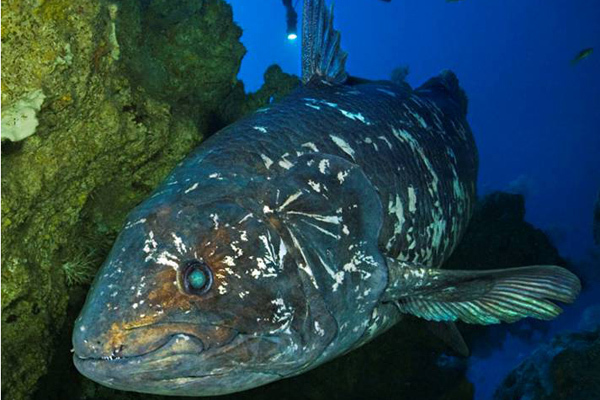 Why Coelacanths are not “Living Fossils”. Bioessays 35: 332-338. CHILDRESS, J.J. & SEIBEL, B.A. 1998. Life at Stable Low Oxygen Levels: Adaptations of Animals to Oceanic Oxygen Minimum Layers. Journal of Experimental Biology 201: 1223-1232. COOK, O.F. 1906. Factors of Species-formation. Science 23 (587): 506-507. FOREY, P.L. 1998. History of the Coelacanth Fishes. Chapman & Hall: New York & London. FRICKE, H. & FRAHM, J. 1992. Evidence for Lecithotrophic Viviparity in the Living Coelacanth. Naturwissenschaften 79: 476-479. FRICKE, H. HISSMANN, K. SCHAUER, J. REINICKE, O. KASANG, L. & PLANTE, R. 1990. Habitat & Population Size of the Coelacanth Latimeria chalumnae at Grand Comoro. Enviro. Biol. Fish. 32: 287-300. FRICKE, H. SCHAUER, J. HISSMANN, K. KASANG, L. & PLANTE, R. 1991. Coelacanth Latimeria chalumnae Aggregates in Caves: First Observations on their Resting Habitat and Social Behaviour. Enviro. Biol. Fish. 30: 281-285. FRIEDMAN, M. COATES, M.I. & ANDERSON, P. 2007. First Discovery of a Primitive Coelacanth Fin Fills a Major Gap in the Evolution of Lobed Fins and Limbs. Evolution & Development 9 (4): 329-37. FROESE, R. & PALOMARES, M.L.D. 2000. Growth, Natural Mortality, Length-Weight Relationship, Maximum Length and Length-at-first-maturity of the Coelacanth Latimeria chalumnae. Environ. Biol. Fish. 58(1): 45-52. HALL, B.K. & HALLGRÍMSSON, B. 2008. Strickberger’s Evolution. 4th Ed. Jones & Bartlett: Massachusetts. HAYS, G.C. RICHARDSON, A.J. & ROBINSON, C. 2005. Climate Change and Marine Plankton. Trends in Ecology and Evolution 20: 337-344. HENDRY, A.P. NOSIL, P. & RIESEBERG, L.H. 2007. The Speed of Ecological Speciation. Funct. Ecol. 21:455-464. HISSMANN, K. FRICKE, H. & SCHAUER, J. 2000. Patterns of Time and Space Utilization in Coelacanths (Latimeria chalumnae) Determined by Ultrasonic Telemetry. Mar. Biol. 136: 943-952. HOLDER, M.T. ERDMANN, M.V. WILCOX, T.P. CALDWELL, R.L. & HILLIS, D.M. 1999. Two Living Species of Coelacanths? PNAS 96 (22): 12616-12620. HUGHES, G.M. 1976. On the Respiration of Latimeria chalumnae. Zool. J. Linn. Soc. 9: 195-208. LAMPERT, K.P. FRICKE, H. HISSMANN, K. & SCHAUER, J. 2012. Population Divergence in East African Coelacanths. Curr. Biol. 22: 439-440. JOHANSON, Z. LONG, J.A. TALENT, J.A. JANVIER, P. & WARREN, J.W. 2006. Oldest Coelacanth, from the Early Devonian of Australia. Biology Letters 2 (3): 443-446. KIMURA, M. 1991. The Neutral Theory of Molecular Evolution: A Review of Recent Evidence. Jpn. J. Genet. 66 (4): 367-386. MAYR, E. 1963. Animal Species and Evolution. Belknap Press: Harvard. NIKAIDO, M. SASAKI, T. EMERSONB, J.J. AIBARA, M. MZIGHANIAC, S.I. BUDEBACF, Y.L. NGATUNGA, B.P. LWATA, M. ABE, Y. LI, W. & OKADA, N. 2011. 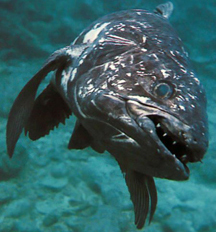 Genetically Distinct Coelacanth Population off the Northern Tanzanian Coast. PNAS 108 (44): 18009-18013. OBSTA, M. FAURBYB, S. BUSSARAWITC, S. & FUNCHD, P. 2012. Molecular Phylogeny of Extant Horseshoe Crabs (Xiphosura, Limulidae) indicates Paleogene Diversification of Asian Species. Molecular Phylogenetics and Evolution 62 (1): 21-26. RIBBINK, A.J. & ROBERTS, M. 2006. African Coelacanth Ecosystem Programme: An overview of the Conference Contributions. South African Journal of Science 102: 409-415. ROMER, A.S. & PARSONS, T.S. 1985. The Vertebrate Body. 6th Ed. Saunders: Philadelphia. ROSSITER, A. 1995. The Cichlid Fish Assemblages of Lake Tanganyika: Ecology, Behaviour and Evolution of its Species Flocks. Advances in Ecological Research 26: 187-252. SCHAEFFER, B. 1952. 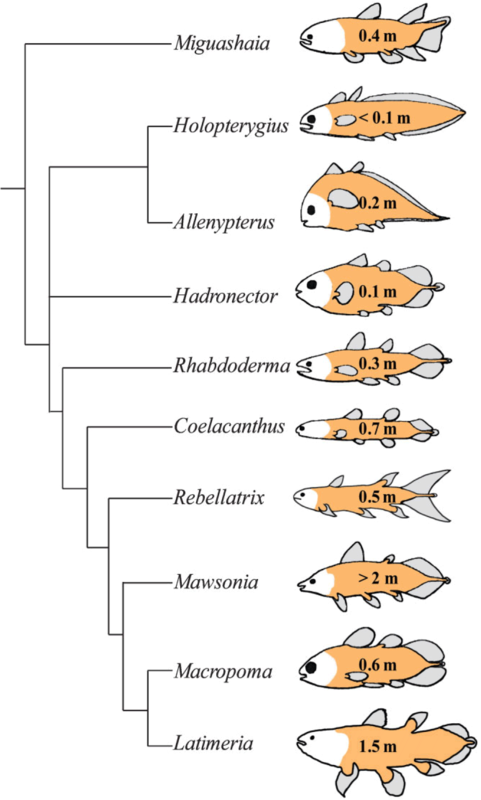 Rates of Evolution in the Coelacanth and Dipnoan Fishes. Society for the Study of Evolution 6 (1): 101-111. SELANDER, R.K. YANG, S.Y. LEWONTIN, R.C. & JOHNSON, W.E. 1970. Genetic Variation in the Horseshoe Crab (Limulus polyphemus), a Phylogenetic “Relic”. Evolution 24 (2): 402-414. SIMPSON, G.G. 1944. Tempo and Mode in Evolution. Columbia University Press: New York. SINERVO, B. MÉNDEZ-DE-LA-CRUZ, F. MILES, D.B. HEULIN, B. BASTIAANS, E. VILLAGRÁN-SANTA CRUZ, M. LARA-RESENDIZ, R. & MARTÍNEZ-MÉNDEZ, N. et al. 2010. Erosion of Lizard Diversity by Climate Change and Altered Thermal Niches. Science 328: 894-899. SNIEGOWSKI, P.D. GERRISH, P.J. JOHNSON, T. & SHAVER, A. 2000. The Evolution of Mutation Rates: Separating Causes from Consequences. Bioessays 22: 1057-1066. STØRMER, L. 1952. Phylogeny and Taxonomy of Fossil Horseshoe Crabs. J. Paleont. 261 (4): 630-639. TAKAHASHI, T. & KOBLMÜLLER, S. 2011. The Adaptive Radiation of Cichlid Fish in Lake Tanganyika: A Morphological Perspective. International Journal of Evolutionary Biology 2011: 620754. TURNER, G.F. SEEHAUSEN, O. KNIGHT, M.E. ALLENDER, C.J. & ROBINSON, R.L. 2001. How Many Species of Cichlid Fishes are there in African Lakes? Molecular Ecology 10 (3): 793-806. TWITCHETT, R.J. WIGNALL, P. B. & BENTON, M. J. 1999. Discussion on Lazarus Taxa and Fossil Abundance at Times of Biotic Crisis. Journal of the Geological Society 156: 453-456. WENDRUFF, A.J. & WILSON, M.V.H 2012. A Fork-Tailed Coelacanth, Rebellatrix divaricera, from the Lower Triassic of Western Canada. J. Verebr. Paleontol. 32: 499-511. WENZ, S. 1981. Un Coelacanthe Géant, Mawsonia lavocati Tabaste, de l’Albien-base du Cénomanien du Sud Marocain. Annales de Paléontologie (Vertébrés) 67: 1-20.